While recounting the last two months, I’ve realized that my time was spent primarily outlining procedures, conducting experiments, and dealing with alternating waves of successful and failed studies. 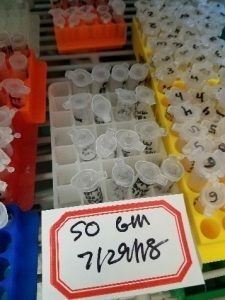 The first eight weeks of my summer internship consisted of tweaking experimental procedures to study vicinal protein thiol oxidations. 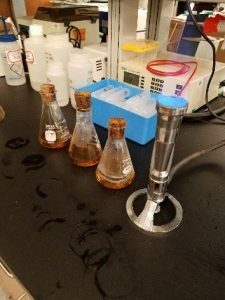 By two weeks ago, my experiments no longer focused on protein thiol oxidations because we encountered enough obstacles trying to study them that we decided that our sanity could be salvaged by pursuing a question pertaining to protein thiol alkylations instead. Perhaps the most challenging aspect of my internship was maintaining interest in the question I was trying to answer when experiencing failure. Each optimization experiment I performed offered hope that we could pursue experiments on pathways of protein thiol oxidations in vivo. Yet, each experiment that implemented stronger protocols revealed a new challenge and a different problem in the methods. Each new and seemingly unpredictable failure with the methodology battered my desire to pursue the hypothesis I outlined at the beginning of this summer. Having been involved in intense research since my freshman year, I expect failures and I love troubleshooting in my research projects. But spending seven hours on an experiment before encountering a flaw in methodology elicits great frustration. Even for those who enjoy their research. Nevertheless, my love of problem-solving and systematic testing enabled me to complete my experiments. Although I failed to prepare methods to study my first research question, persistence in research facilitated experimental success in beginning to elucidate the mechanisms of protein thiol alkylation by 3-Bromopyruvate. A few days after we changed the focus of my project, we successfully completed an experiment and obtained reasonable data. The optimization experiments that I viewed as failures several weeks ago allowed us to obtain data successfully. Thus, effectively obtaining usable results with the methods I designed—over a period of several months—in collaboration with Dr. Foley and my other lab partners was the most rewarding aspect of my summer research project.